In the summer of 1970, I was 16 and hopelessly obsessed with building and airbrushing plastic model airplanes. A wing-nut; plane crazy. 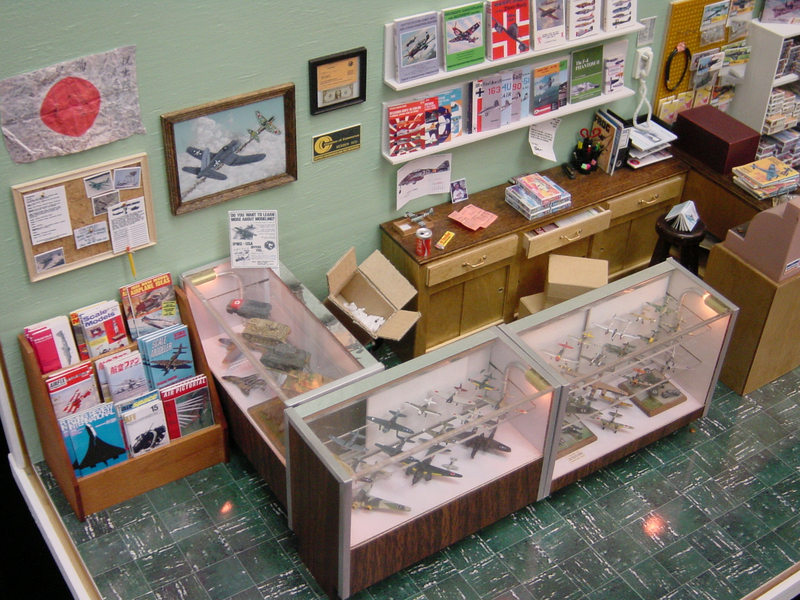 I had all of the Los Angeles and Orange County hobby shops pegged with nose print signatures on the glass of every display case and went goo-goo over cool box art and the latest hobby magazines like Scale Modeler and Koku-fan. 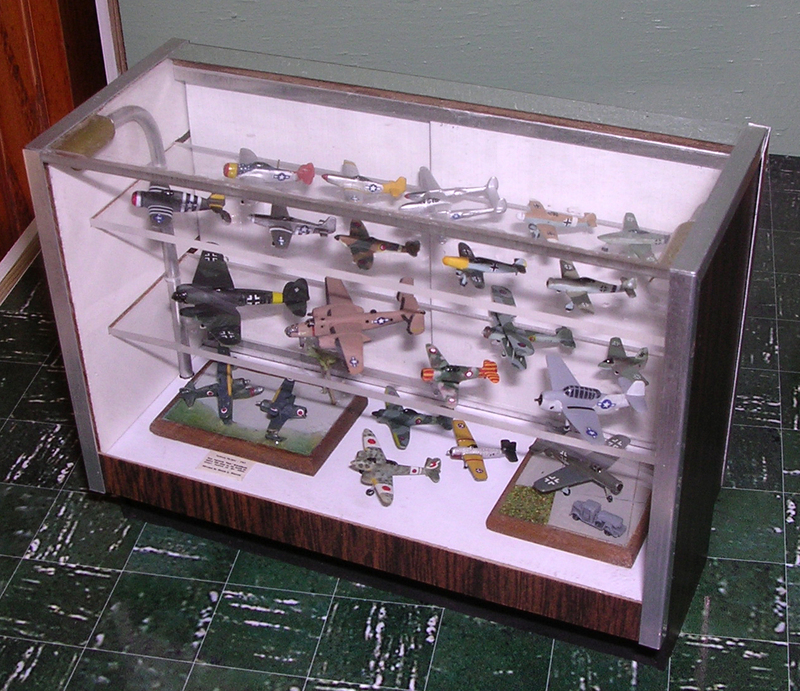 I was well on my way to filling a six-foot long glass case in my enclosed porch with built up and airbrushed (and not bad at that) 1/72nd scale model aircraft. Those times are now very nostalgic, when my only responsibilities were homework and to put the lid back on the thinner. Fast forward three decades. While wandering aimlessly through a dollhouse miniature shop, I stumbled across a tiny display case with inside lighting and three 'glass' shelves. This intriguing discovery along with the realization that tiny 1/700th scale model aircraft available from Japan at the time would fit in it nicely. 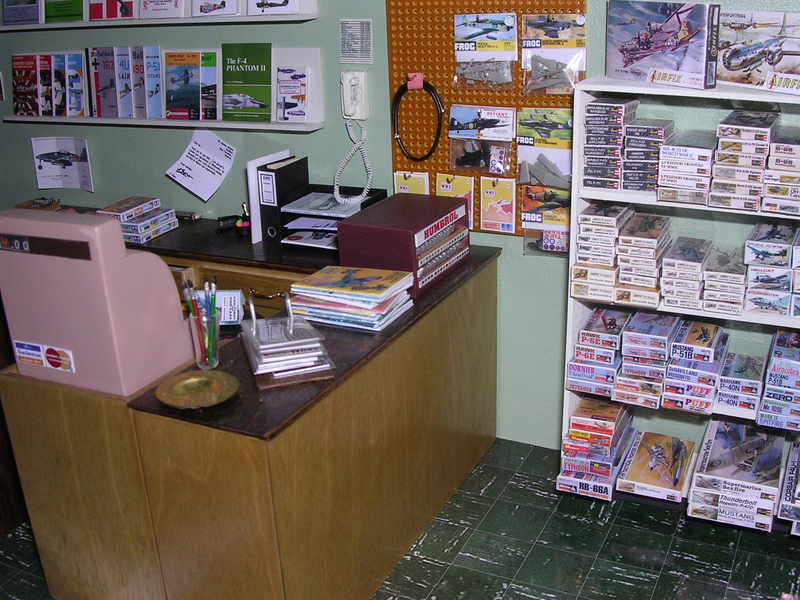 Since I had good sight in both eyes but liked to live dangerously, I decided to create a 1/12th scale miniature of a typical hobby shop from my youth. 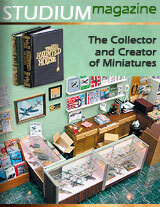 I meticulously planned out everything that would have appeared in the shop around mid-1970, and, armed with a trusty laptop and a Canon portable flatbed scanner began my search in old book stores, kit collector's conventions, and on eBay for old hobby magazines, books and model kit box art. 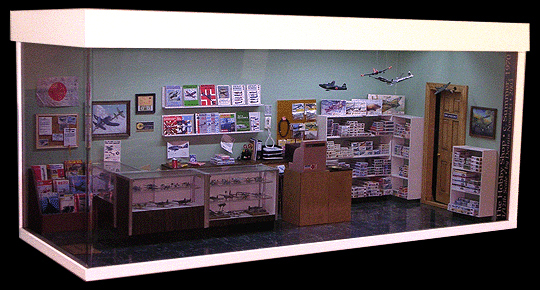 After doing a layout on paper, thinking back on those shops I visited (Valley Plaza Hobbies in North Hollywood, Brookhurst Hobbies in Garden Grove, Paul Phrailler's in Westwood among others), I figured the size of the shadow box I'd need would come to around two feet in length and nearly a foot in width, which would include a magazine rack, a couple of display cases, counters, bookshelves and shelving for kits. The publications and kits were in many cases scanned using a portable scanner connected to a laptop with the gracious permission from the sellers, and later modified in Adobe Photoshop to the appropriate size and made like new. 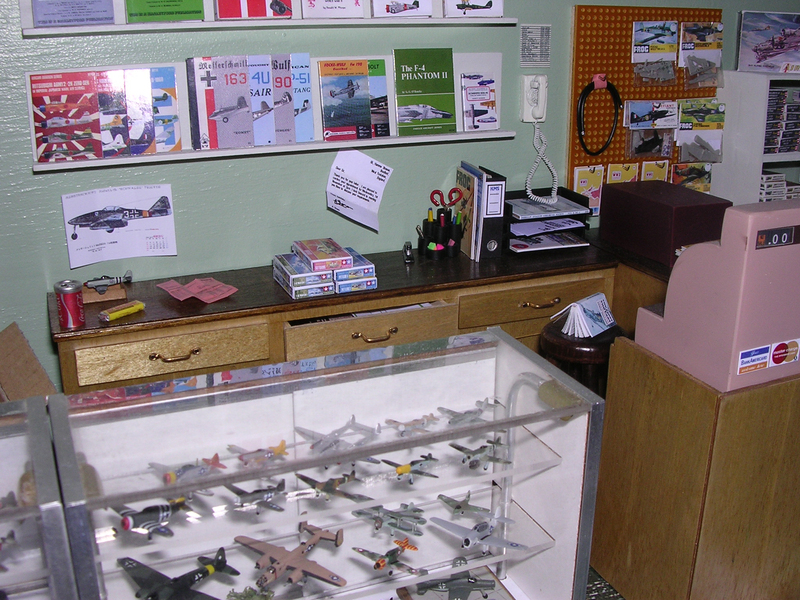 Some of the books and magazines as well as many of the kits were found on the web, often through eBay. These images required more drastic adjustments in Photoshop. Since virtually all had no sides visible, I had to recreate the graphics from scratch, following closely the original designs. Once the graphics were finished, they were laid out and reduced in size on a Microsoft Word document and printed using a Canon S520 photo printer with glossy photo paper. Then they were painstakingly cut out with an Exact-o knife, scored, folded and tacky glued around plastic sheet for the books and magazines or hand cut and sanded tiny wooden blocks for the model kits. Each of the 199 kit boxes took an average of 45 minutes to complete. The tiny aircraft were produced in Japan by Aoshima, Hasegawa, Skywave, Pit Road, Tamiya and Fujimi, largely as accessories for waterline model ships. After cleaning them up with some sandpaper and modifying some with putty for different variants, each was painstakingly masked and sprayed with a Passche VL1 airbrush in the appropriately accurate camouflage scheme using ModelMaster paints. Decals by Gold Medal Models or if worthy, those provided in the kits were added using the Microscale system, after which they were sprayed a flat coat. Each micro-miniature model took an average of six hours to complete, with a total of 46 aircraft and four 1/350th scale armor pieces by GHQ making up the display. A few of the furnishings were purchased from a dollhouse miniatures shop while the rest were constructed by hand. The rear and side counters and the cash register stand were created from raw basswood strips cut to shape, then covered with a smooth basswood veneer stained a light oak, while the tops were stained dark walnut. Openings for a drawer, sliding panels and a cabinet under the register were added. Drawer handles were attached with trimmed pin heads. The kit and book shelves were simply basswood planks sized and glued together, then sprayed semi-gloss white. 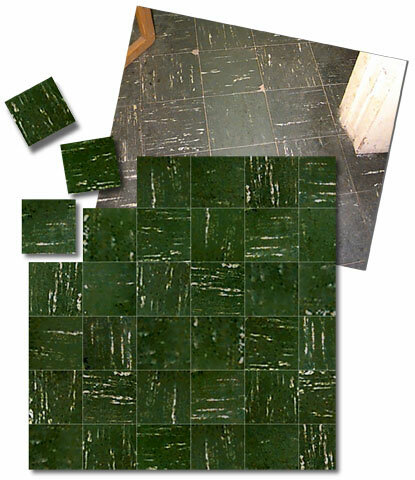 During the 1960s and early 1970s, Vinyl Asbestos Tile was used in many stores and homes. I found a photo online, and from this extracted the separate tiles. Approximately 25 individual tiles were created in Photoshop, and then assembled together in an inconsistent pattern to form the flooring. Then it was printed on glossy Kodak photo stock and added to the base. Various details were added for continuity and accuracy, including a Humbrol paint rack with miniature paint tins from metal tubing, a cash register formed from plastic sheet and bits of wire, a bulletin board from sanded cork and wood framing, a filled trash can, cardboard boxes and a crumpled Japanese battle flag. The two dogfight paintings were hand painted on framed plastic sheet using acrylics. The door to the back room is store-bought and stained, with the Photoshop'd paper 'Employees Only' sign added. The custom made shadow box was beyond my abilities, so I had it created by Creative Concepts in Wood in New Jersey. I was particularly taken by the folded plexiglass front that provided uninterrupted viewing. They included a thin power strip for providing power to the lamps inside each of the display cases. As flourescent lighting was found in hobby shops of the day, I had a miniature flourescent lighting fixture made by Peter Tucker of Roomboxes, Etc. in Canada. A hole was drilled in the top for a power jack and all was complete. As I look back at the mounds of effort, patience and nearly a year I put into this project, I'm still drawn back to those times of my youth when I discovered my creative and technical skills in making a plastic form into reality. I've found that you actually can go back home again...especially if you're really small.